The a vintage technique and some Aleene's Tacky Glue for this project. If you like to make crafts from recycled materials, then you'll love making your own Burnt Brown Bag Box from Heidi Borchers. This is a great piece to display or give as a gift. 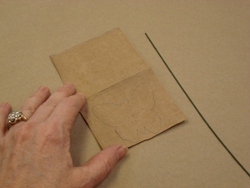 Draw pattern onto the inside of the brown bag with pencil. 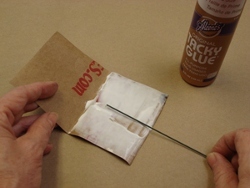 Squeegee glue to the inside of the brown bag. Place piece of 18 gauge wire into the glue. 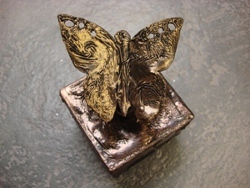 Press the two thicknesses together and line up the wire with the body of the butterfly. Let glue dry. Cut out along pencil line. 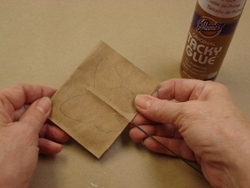 Place glue onto the butterfly shape. You will be burning wet glue, do not let the glue dry. 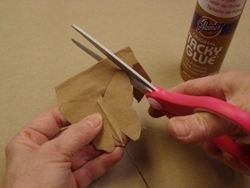 Place the butterfly shape with the wet glue into the top of the candle flame. 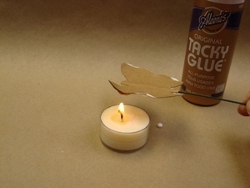 NOTE: Use standard precautions when burning the glue including good air ventilation, and keep a bowl of water handy should the brown bag become ignited. 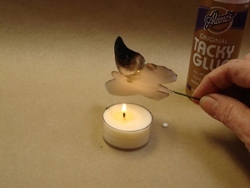 Keep the butterfly shape with the wet glue rotating in the candle flame. Continue to turn it over to check progress. 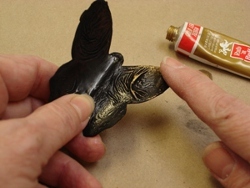 The burning of the glue will cause the glue to turn black and “sooty”. Continue until the entire butterfly is black. Let dry. (You may then repeat process for the reverse side of the butterfly.) 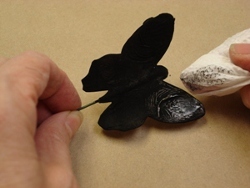 After butterfly is completely dry, remove the soot with a paper towel. Lightly apply the Rub n Buff with your finger. You do not want to cover all the black area. 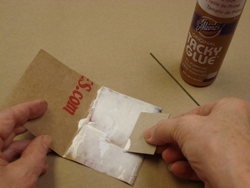 If you add too much, you may reapply the glue and repeat the above steps. Repeat the process with the box. 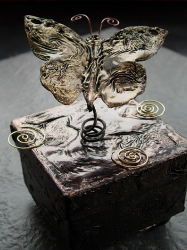 Twist the attached wire on the butterfly on a pencil. Make a small hole at the top center of the box, insert the end of the wire into glue, then into hole. If desired, make antenna from wire and glue in place on butterfly. Let glue dry. For a comprehensive video tutorial of this project, check out How to Make a Burnt Brown Bag Butterfly Box.